Pro-Ject Essential III review | What Hi-Fi? For a small but loyal band of music lovers, vinyl is well and truly back on the menu – and turntable manufacturers are doing their best to make hay while the sun shines. Pro-Ject is one such brand. A relative newcomer, the company has made its presence felt with an unrivalled stream of four- and five-star turntables over the last 20 years. The Pro-Ject Essential III is the latest addition to the roster. 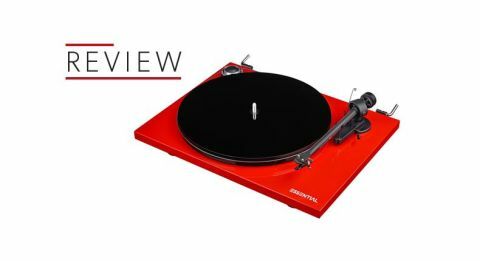 The first Pro-Ject Essential range first appeared at the turn of the decade and went on to take home multiple five-star reviews and What Hi-Fi? Awards. This third incarnation has been four years in the making and joins a sub-£300 turntable market that’s more crowded than ever. Pro-Ject now has two models below the Essential – the Elemental (£150) and Primary (£190) – but calls the £240 Essential III “the first true hi-fi offering”. Luckily, the Essential III has plenty to offer. Four years is a long time and, sure enough, there have been a host of upgrades. The platter and plinth are now MDF rather than chipboard – as is the case on plenty of far more expensive decks – while the cartridge and cables have also been upgraded, with the Ortofon OM10 on board here. From the pulley to the spindle bearings, the motor electronics to a new grounding link – Pro-Ject has gone to town on the tweaks. A belt-drive deck remains a relatively simple machine and while it’s not quite as easy to get started as some budget turntables, the little work required should be straightforward, dare we even say enjoyable, for the average vinyl enthusiast. Just put the platter in place and feed the belt around it. Manually switch the belt between the inner and outer ring of the pulley to select 33 or 45 rpm. Adjusting the counterweight to balance the cartridge is a little fiddly, while the anti-skating thread seems fussy, but follow the instructions and you’ll be spinning records well within half an hour of unboxing. And the result is a turntable that certainly looks better than a budget deck, even if the lightweight feel of the deck and tonearm is more in tune with its price. Place a record on the platter – a mat is optional and there isn’t one included – and you’ll soon be treated to the trademark Pro-Ject sound. This is a good thing. Listening to Stetsasonic’s Talkin' All That Jazz is easy and enjoyable, thanks to good dynamics, an exciting treble, and a sonic balance that’s on the bright side but never edgy. Dial it down a notch with Carl Orff’s Carmina Burana and the Essential III does an impressive job of placing instruments in the room, while showing decent scale and an open soundstage. What’s not to like? Very little. That is until we involve the Rega Planar 1, our sub-£300 Award-winner. There’s not much in it but the Rega does time a little better, skipping along at a pace that forces your toe to tap, while also delivering a better-organised, fuller-bodied sound. Laurent Garnier’s The Man With The Red Face affirms this in a matter of revolutions. Different strokes for different folks? Absolutely. We’d lean towards the Rega but we’d recommend hearing both. But there’s a twist. Also in Pro-Ject’s arsenal is the Essential III A. That ‘A’ refers to an acrylic platter upgrade (called the Pro-Ject Acryl-IT E). The A turntable costs an extra £40 – but it’s money well spent. The sound is instantly bigger and more open, while bass notes are firmer for a more rounded presentation. And there’s an extra layer of detail for good measure. The Essential III A and the Rega P1 are definitely something of a toss-up.